Fibercations is closed until Kreston Starts School. Sorry for the inconvenience. Please check ebay for our online store. Fibercations is growing from the creative side of Between the Oaks farm where a small herd of Angora goats and alpacas thrive. Needing a place to market fiber produced on the farm and finding that like-minded friends are also in need of a clearing house, Kathy and Bob have converted an abandoned milking parlor into a spinner's and handknitter's source of wonderful fibers and yarns. Please remember that at this time this store is a one gal operation. Kathy will be happy to make an appointment with you when you are available to come. We're open most days about 9 or 10, occasionally as early as 7. But some days as late as 12 or 1. We close about 5:30 or 6, occasionally about 4 or 5, but sometimes as late as 11 or 12. Some days or afternoons, we aren't here at all, and lately I've been here just about all the time, except when I'm someplace else, but I should be here then too. Call if you can or take your chances. Remember that there are lots of chores to be done around the farm so be sure that Kathy isn't in another barn trimming hooves or at home behind the big gray barn. HAPPY UPDATE: We have adopted the smartest, cutest, most fun little boy. He's 2 years old. Fibercations is now on a back burner since Kathy has much more important things to do, like diapers and kissing boo-boos and teaching the alphabet. Our inventory is slowly reducing and won't be replaced until he's off to school. There is still a chance that we have what you need but we do not do special orders anymore. If you email us, please put "Fibercations" "Spining" or something fiber related in the subject line. Those emails with blank lines tend to get deleted with all that spam that gets through the filter. When I finally found the man of my dreams, I dropped everything to be with him. I left my job, home, friends and family and moved from Amarillo, Texas, 2000 miles away, to a climate opposite of what I had been in my entire life. After 10 years I'm so glad that I did. Throughout our courtship, wherever we went, someone was demonstrating spinning. I decided that spinning was the Northwest thing to do and I needed to fit in so I took a lesson with the Aurora Colony Handspinners, a not-so-local guild. 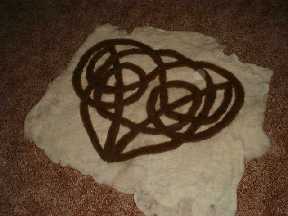 I was hooked on fiber arts from the very beginning. It took several weeks of diligent spinning before I really felt like I was accomplishing a decent yarn, but in that time I found a limitless source of friendship from that far away guild that I now call mine. 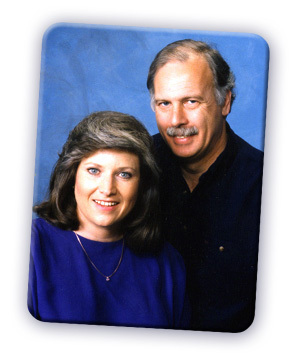 Bob and I married April 29, 1995. We bought an abandoned dairy and now live on our 20 acre play farm just north of BattleGround, Washington. We have a vast array of comical critters that give us no end of pleasure with their antics. Thank you for visiting Fibercations web site. Please feel free to ask if you don't see what you want. Unfortunately, we can't include everything we carry on the website, but we try. I finished 3 pair of these slippers just by knitting evenings between the time we got back from Thailand just before Thanksgiving and the week before Christmas. Yes, I had jet lag big time but knitting seemed to help. 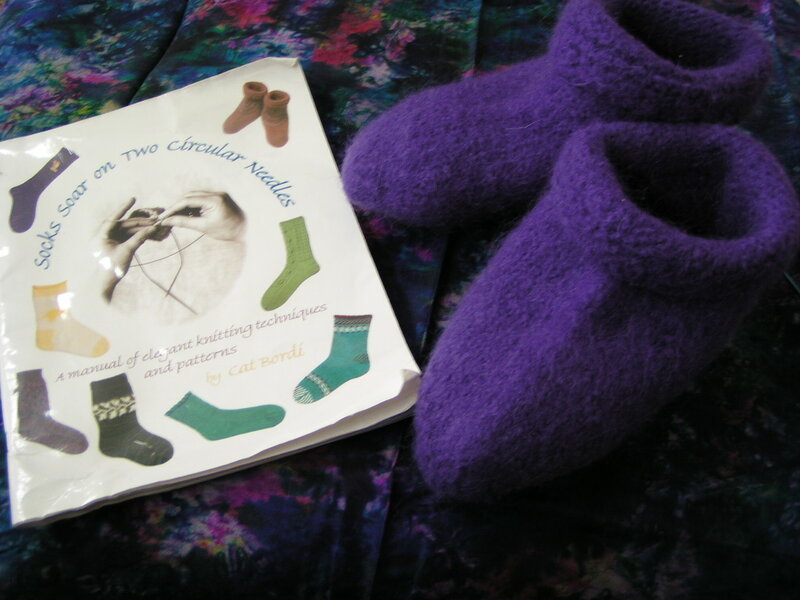 The pattern is like a regular sock pattern with gussets and heels but you knit them with Brown Sheep's Bulky and on two circular Addi Turbo needles then throw them in the washer for felting. I did both socks at the same time and as Cat says, they soar!. If this books looks a little tattered, it's because it's been used a lot. 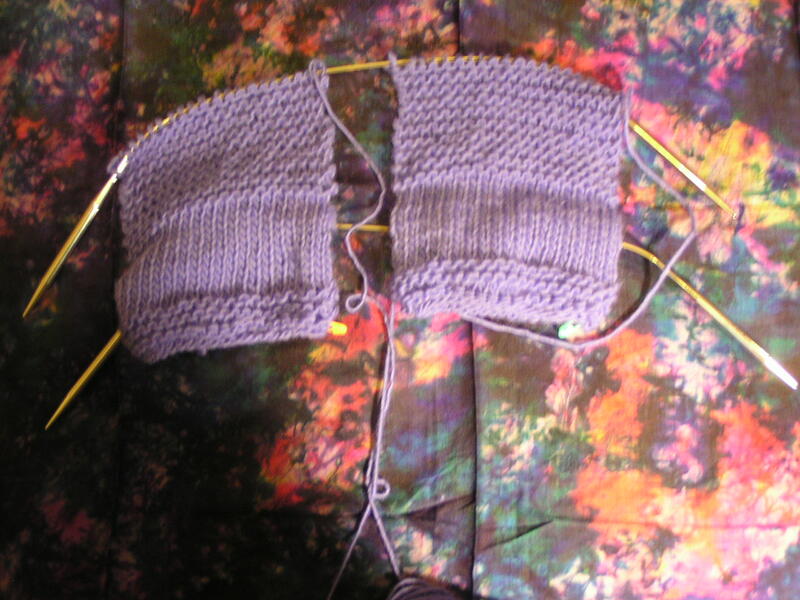 I will never go back to knitting socks on all those double points again. I love having sweaters drying on my living room floor. My unmarried son Lance will be 31 on the 24th of February. He loves scuba diving and sometimes goes in very cold weather. He asked for a rag wool sweater. This is the easiest thing I've ever knitted. I used a pattern from Spin Craft. 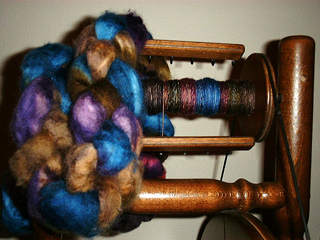 When I first learned to spin, I went through two pounds of beautiful blue merino. I thought that it was so over spun that I would never use it for anything. Plyed with some recently made yarn from "easy spin" fiber that I use to teach spinning, it came out perfect. I'll have to get him to model it when it's dry. Just a note of warning...I used the new "Premium Care Downy - calming mist fragrance" on this sweater. After blocking and drying, the perfume in the softener was so strong that I rinsed the sweater in hot water. It still had an unpleasant smell. I washed it twice with Orvis before I felt that the fragrance washed out enough for Lance to wear. They're right, it penetrates deep into the fabric. This bottle of Downy won't be opened in this house again. The perfume smell also changed considerably from the bottle to to a load of towels that also had to be rewashed. Ayala Talpai's needle felting class at the Oregon Flock and Fiber festival was so much fun. The design in this wall hanging came from a necklass Bob gave me last year for Christmas. I used fiber from a fleece I bought from Jan McMahon's morit flock. I've decided that it will need a border from that fleece, so expect an update on this one after the felting needles come in. I broke mine. Update: The fiber in this project is Romney and never did felt well. I think of it as another learning experience. Before you take on a big felting project, be sure to test your fiber for it's felting capabilities by using a small amount to make a felt ball. If you don't have a felted ball in your hand after only a short time with hot water and soap, it may not be your best choice for that project. Several people have told me that Romney often does not felt at all. 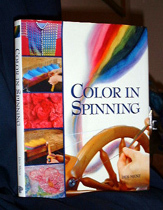 Deb Menz's book, "Color in Spinning" has got me handpainting rovings. I have some superwash merino wool that is impossible to felt. Using her directions, I soak 4 ounces of the rovings in a vinegar and water solution. 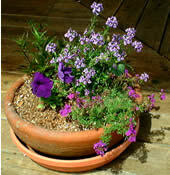 Lay it out on a piece of plastic wrap and paint with measured amounts of dye. Wrap it up in the plastic wrap, roll it up and steam it on a rack in my dye pot for at least 20 minutes. Cool, rinse, and dry. They are beautiful! Any dye I have left I pour into a bucket, add a bit of water and throw in a handful of mohair. Creates some interesting colors. Sadly, this book is out of print. 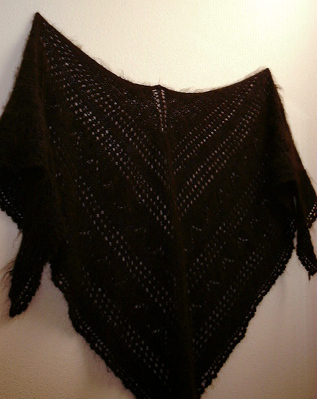 A single ply of natural black alpaca and a single ply of navy blue silk makes a very lovely, compliment getting shawl. The lace pattern I used is from Spin Craft. If you have a project you would like to include in our website, please send picture and how you did it to Kathy@Fibercations.com. If you email us, please put "Fibercations" "Spining" or something in the subject line. Those emails with blank lines tend to get deleted with all that spam that gets through the filter.